William Henry Collison was born on 12 November 1847 in County Armagh (Northern Ireland), to John J. Collison and Mary Emily Maxwell. He was educated at the Church of Ireland Training College in Dublin and began his career as a schoolmaster in charge of an industrial school at Cork. In November 1872 he read of the Church Missionary Society's need for recruits, and determined to apply. The following April he entered the Church Missionary College (CMS) in Islington (London) for a brief period of training. The CMS decided that his qualifications made him a suitable assistant for William Duncan, the lay missionary in charge of the North Pacific mission, centred at Metlakatla, B.C. The CMS, which had difficulty in placing ordained missionaries there, opted to send Collison out as a layman with a view to his later ordination, and gave him permission to marry before leaving. On 19 August 1873 he married Marion M. Goodwin, a woman well prepared for the mission field: she was a deaconess and a trained nurse who had served in the Franco-German War and during a smallpox epidemic in Cork. The Collisons arrived in Victoria on 25 October 1873 and finally reached their north coast destination a month later. At Metlakatla, his first task was to learn the Tsimshian language. By the following summer he could conduct the greater part of church services without an interpreter. As well as preaching, his duties included visiting and teaching. He became interested in the Haida peoples when a group from Masset, on Haida Gwaii (the Queen Charlotte Islands) visited Fort Simpson (Lax Kw'alaams) in 1874 and 1875. During these visits he began to evangelize Chief Seegay, whose half-Tsimshian wife acted as translator. In June 1876 Collison was begged to minister to Seegay since he was dying of tuberculosis. Collison made the voyage to Masset, and on his return obtained permission to open a mission there. After the Collisons' move to Masset in November, William expanded his knowledge of Haida, eventually translating portions of the Bible and the Book of Common Prayer and composing hymns in this language. In November 1877 while the Collisons were on Haida Gwaii, Bishop William Carpenter Bompas of Athabasca arrived at Metlakatla and spent the winter. 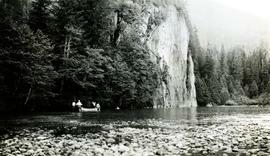 The following March at Kincolith, a CMS mission among the Nisga'a peoples located at the mouth of the Nass River, Collison was ordained deacon and priest by Bompas, and assigned the "spiritual charge" of Metlakatla, Kincolith, and Haida Gwaii. In 1879 Collison left the Haida mission and returned to Metlakatla, and in May 1884 he and his family again changed missions and moved to Kincolith. There he learned more Nisga’a, and soon translated the services of Morning and Evening prayer. In 1891 Collison was unanimously selected as the new diocese of Caledonia's first archdeacon. Disaster struck Kincolith in September 1893 when the church and three-quarters of the village were destroyed by fire. Shortly after rebuilding had begun, a fervent spiritual revival threatened to undermine the stability of the community. In response, Collison introduced a native branch of the Church Army, a strongly evangelical Anglican organization that emphasized enthusiastic worship, and promoted native leadership within the church-sponsored society. This Army was also characterized by its brass band which assisted in the very musical, evangelistic mission services. Marion Collison's role was equally significant. Like other missionary wives, she was responsible for teaching European domestic skills to the native women. As a nurse, she helped avert a smallpox epidemic and Collison regarded her medical contributions as central to his work. Together the Collisons had five sons and three daughters: William Edwin (W.E. ), Henry Alexander (H.A. ), John, Thomas, Herbert, Arthur, Alice, Elsie and Emily. Marion Collison passed away in Kincolith on 9 January 1919. W.H. Collison was the longest serving Church Missionary College (CMS) missionary in the North British Columbia Mission and he was the only remaining missionary funded directly by the CMS. His memoirs can be read in his autobiography, “In the Wake of the War Canoe” (1915) through which one can see that his interaction with the First Nations peoples to which he ministered was complex. He respected the converts, became fluent in Tsimshian, Haida, and Nisga'a, and was sensitive to the importance of the clan system. According to his son William Edwin, also an ordained missionary, the elder Collison had actually been adopted into the Eagle clan of the Haida Nation. On the other hand, he fiercely opposed potlatching and traditional native medicine, and encouraged the Nisga'a at Kincolith to accept the Indian Advancement Act of 1884, which replaced traditional hierarchies of power with a system of elected chiefs and band councils supervised by an Indian agent. W.H. Collison died in Kincolith on 21 January 1922. The Archdeacon W.H. 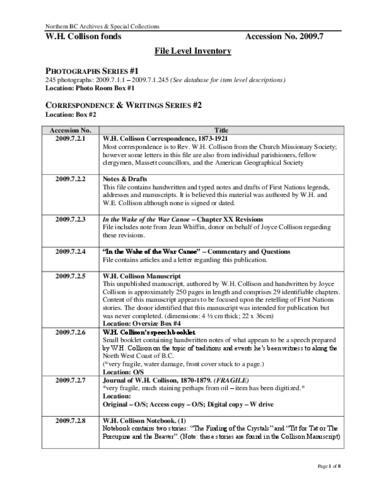 Collison fonds consists of textual materials, maps, published materials and photographs all documenting Collison’s life and work with North Coastal First Nations communities in British Columbia. Types of records found within this fonds include manuscripts, sermon notes, correspondence, oral history summaries, monographs, cartographic items, photographs and postcards. The Collison fonds also includes some records created by his children and grandchildren as well as a family tree created in 1986. The Collison fonds has been divided into four series. All photographic materials have been scanned and are also available in .tiff and .jpeg formats. Some restrictions are in effect, see individual descriptions for accessibility. Two additional fonds located at the Anglican Diocese of Caledonia Archives also has materials pertaining to W.H. Collison: "The Robert Gurd fonds" and the "Church Army for the Diocese of Caledonia fonds."